Which came first, the chicken or the egg? This classical ‘chicken-or-egg’ dilemma applies in particular to the developmental processes of life on earth. The basis of evolution was a gradual transition from purely chemical reactions towards the ability of the first life forms to convert carbon via metabolic processes, with the help of enzymes. In this transition, early life forms soon developed different strategies for energy production and matter conversion. The Hypothesis on the Synchronistic Evolution of Autotrophy and Heterotrophy assumes that the opposing processes must have developed at the same time. In principle, science distinguishes between so-called heterotrophic and autotrophic organisms: the first group, which includes all animals for example, uses various organic substances as energy sources. Their metabolic processes produce CO2 - amongst other things - during respiration. In contrast, autotrophic organisms exclusively use inorganic carbon compounds for their metabolism. This group includes all plants, which carry out photosynthesis and thereby bind CO2 to gain energy from sunlight. In evolution research, scientists around the world have long discussed which of the two basic metabolic strategies developed first - autotrophy or heterotrophy, i.e. photosynthesis or respiration. Dr Kirstin Gutekunst, research associate in the Plant Cell Physiology and Biotechnology Group at the Botanical Institute at Kiel University, proposes instead that both developments may have occurred simultaneously and in parallel. The Kiel botanist presents this novel theory for discussion, which she has titled "Hypothesis on the Synchronistic Evolution of Autotrophy and Heterotrophy", in the journal Trends in Biochemical Sciences. Gutekunst argues as follows: in terms of matter conversion, the earth represents a closed system. The quantity of every kind of matter on earth cannot be changed - it is only continuously converted and reassembled. There must therefore be a balance in such a system - otherwise certain substances would be permanently removed and others permanently added. The logical conclusion is that for every metabolic process, there must be a corresponding opposing process - either within the same organism, or in two different organisms which have opposing metabolic processes. A third core argument of the new hypothesis lies in the fact that the main drivers of the metabolism, the enzymes, can inherently act in two directions - so therefore, every metabolic reaction can be reversed by the corresponding opposing reaction. Metabolic processes overall are not linear, but rather cyclical, and have a global balance of materials. "The current scientific knowledge suggests that heterotrophy and autotrophy cannot have developed independently of each other. In a closed system that is characterised by a balance of materials, then both metabolic processes are interdependent," said Kirstin Gutekunst. "Just like neither the chicken nor the egg could have originated first, so too heterotrophic and autotrophic organisms cannot have developed after each other," continued the Kiel plant researcher. An example of this kind of balance of materials can be found in cyanobacteria, also known as blue-green algae. 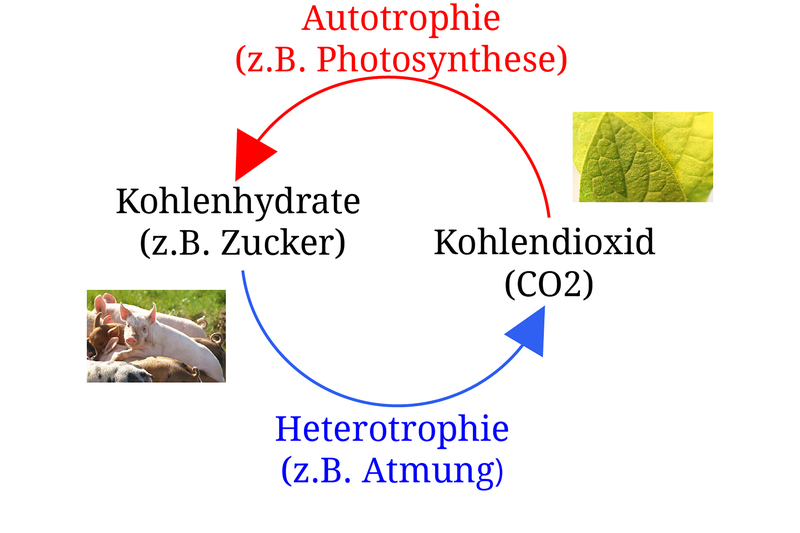 They combine the metabolic processes of photosynthesis and respiration in one organism, and thus display heterotrophic and autotrophic properties at the same time. Here, these processes are particularly closely linked, and are based on identical molecular components. The new theory of the Kiel researcher could thus provide impetus to re-evaluating the existing conception of the origin of life on earth in future. In principle, the question of origin can only be viewed hypothetically. However, Gutekunst’s theory offers credible indices against the idea of a singular origin, which in essence is technically based on an unscientific idea of creation. In contrast, the proposed synchronistic hypothesis suggests a duality right from the beginning of evolution. If metabolic processes based on the effect of enzymes are acknowledged as a characteristic of life, then for each reaction there must also be an opposing reaction. Such an evolution can therefore only have started at the same time, and from there onwards developed in parallel. Gutekunst’s thesis is thus a strong argument against the assumption of a singular origin of autotrophy or heterotrophy. The publication forms part of the plant research conducted within the priority research area "Kiel Life Science" at Kiel University. Currently, the scientists in this area are striving to network with each other better, and to encourage mutual exchange of ideas and information. In this context, together with partner institutions in the region, they are preparing the formation of an independent, interdisciplinary centre for plant research at Kiel University.